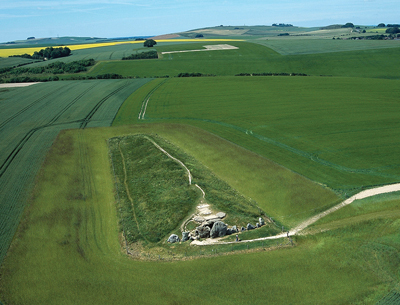 Long barrows are among the earliest manmade monuments to survive in Britain. They usually contain multiple burials and are often positioned on hills and ridges so as to stand out in the landscape, perhaps as a means of demarcating territories. This one at West Kennet, near Avebury in Wiltshire, was built in about 3,650bc and remained in use for a millennium. 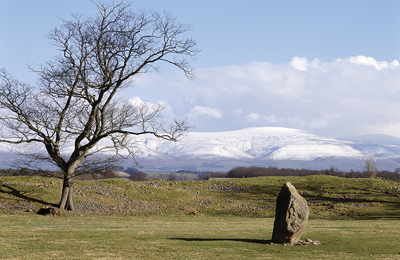 The great enclosure of Mayburgh Henge, Cumbria, is one of a pair of prehistoric monuments built between 2,000bc and 1,000bc near the River Eamont. Its huge banks, broken at one point to create an entrance, are constructed of river boulders. This standing stone is the sole survivor of at least eight that once existed here. The mile-long stretch of ancient road that runs through the Yorkshire moors at Wheeldale is probably Roman. The network of roads built by the Romans remains important in Britain even now. In very few places, however, is it possible to appreciate the original appearance or scale of these monuments or understand the significance of road building in a wilderness. 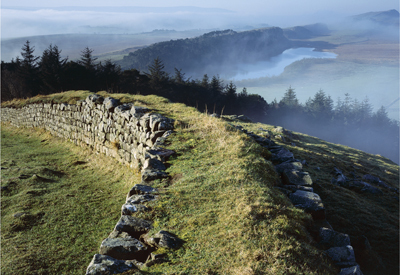 Hadrian’s Wall is perhaps the most celebrated Roman monument in Britain. Built from coast to coast by the Emperor Hadrian following his visit to Britain in ad122, the wall is about 75 miles in length. It is, in fact, one of several boundaries erected by the Romans to define the northern border of the Roman Empire in Britain. A detail of the Roman-esque wall paintings in the chancel of St Mary’s Church, Kempley, Gloucestershire. The paintings were possibly commissioned in about 1130 by Hugh de Lacy. A 360˚ virtual tour of the church, to be viewed online, is being prepared. The inner bailey of Norham Castle, Northumberland. The castle was developed from the 1120s by the Bishops of Durham as one of the most important strongholds on the Scottish border. Its great tower, currently in the course of restoration, was built in several stages and remains the largest in the north of England. yard houses is a small under-ground chamber of uncertain function known as a fogou. of England’s medieval monasteries, suppressed from 1536 by Henry VIII, are testimony to the huge importance of these institutions in our distant history. of this Augustinian house every time they processed into the church. Its rich abstract ornament, includ-ing zig-zag and spiral patterns, is typical of late-12th-century architectural sculpture in the region. Moreton Corbet Castle, Shropshire, was remodelled after 1573 with a new range smothered in sculpted ornament. The wonderfully eccentric design is informed by French and Dutch example. Under the windows of the new range was laid out a large formal garden, the outline of which can still be traced in the adjacent field. Nunney Castle, Somerset, was built by Sir John de la Mare under a licence issued in 1373. Its central tower, enclosed within a moat, holds all the rooms necessary for grand domestic living in the period. On Christmas Day, 1910, one wall of the roofless build-ing collapsed. In 1926, it was taken into guardianship. 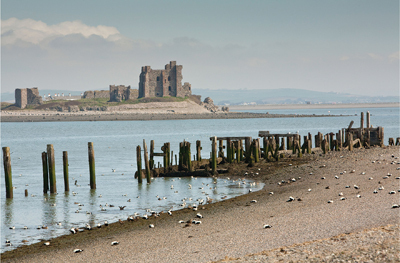 A distant view of Piel Castle, Cumbria, on its tidal island. It was built by the abbots of Furness, a rich Cistercian abbey responsible for the defence of the Western March with Scotland under a royal licence dated September 1327. The castle was probably meant to control trade with the Isle of Man and Ireland. 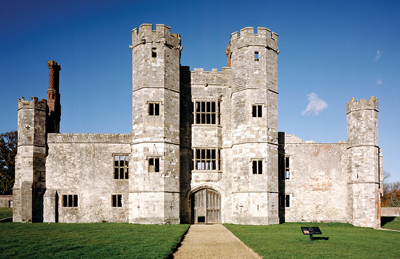 The Premonstratensian abbey of Titchfield, Hampshire, was con-verted by Thomas Wriothesley into a residence from 1537. The main gatehouse was built through the centre of the church nave and led to a court created within the clois-ter. It was battlemented throughout and supplied with superbly detailed brick gables and chimneys. Sutton Scarsdale Hall, Derby-shire, was built in the 1720s and its furnishings were stripped out in the early 20th century. The loss of the roof in 1919 caused the rapid decay of the interior. Some of the rich plasterwork that ornamented the principal rooms still survives. St Catherine’s Oratory-or the Pepperpot as it’s affectionately known-is a lighthouse on the Isle of Wight thought to have been built in 1328. It is popularly associated with a certain Walter de Godeton, a local landowner. The tower was formerly attached to a chapel and its two buttresses are the tidied-up wall stubs of this lost building.